So, I’ve just discovered something amazing. You can mill flour. At home. In your blender. For years I’ve known that buying flour pre-ground in the store as opposed to making your own, is like eating frozen TV dinners instead of having your grandmother cook you up a delicious Salisbury steak. Okay, strange example, but you get the picture. Moving on. Why mill you own flour anyway? I think that the number one reason you should grind your own grain flours is for the health benefits. All commercially made grain flours have had the germ removed. This is the part of the grain that contains the majority of the nutrition, since it is the part that allows the seed to germinate. Without the healthy oils, vitamins and minerals that make up the germ, the (dead) flour can happily sit on the shelf for months or even years and still be edible. In addition, when flour is milled, the bran or “shell” of the grain is broken, leaving the insides exposed, causing the loss of vital nutrients and oxidization of fats. Ever noticed how right after you peel and apple, it starts to turn brown? The delicate, vulnerable interior of a grain goes through the same degradation process and almost as quickly. Whole Wheat in fact, loses 45% of it’s nutrients within the first 24 hours after it has been milled, and by the time 72 hours has passed it has lost a whopping 90%! That is 90% of the original nutritional value of a very wholesome grain that does not make it in to your body. Is it any wonder we have to take nutritional supplements? Milling your own flour ensures that you preserve the grains’ vital nutrients for your consumption since you will use it immediately. The second reason is flavour. The taste of the flour I made myself actually tastes like something. Even the “good flour” I used to buy at health food stores, never tasted this good, and often they were dry and sometimes tasted bitter (this indicated rancidity!) With home milled flour my bread is moister and has a wonderful fresh and nutty taste that comes from the inclusion of the germ. Finally, grinding your own flours can give you access to flours that you might not be able to get otherwise. For example, spelt flour or kamut flour can be hard to find in a regular supermarket. However, finding the whole grain is often easier as whole grains keep a very long time and so are easier for stores to carry. Also, these specialty flours are cheaper when ground at home. A pound of spelt grain is much cheaper than a pound of spelt flour assuming you can find it. Also, you have control over how much you have on hand, how fine or course it is ground, etc. For those that are gluten-sensitive or intolerant, you can even make high-protein flours from beans and lentils. I baked a loaf of bread from all the grains in the photograph at the top of this post. It’s a meal in itself, I guarantee! Most people don’t believe that they can grind flour in their home blender (isn’t it only good for making milkshakes? ), but it’s true – even a very cheap one, like mine, can get the job done. All you have to do is add enough grain so that it doesn’t just fly around inside the container. If you add at least 2 cups of grain, the weight of it will keep the kernels down around the blades. 1. Place at least 2 cups of the grain (or legume) of your choice (wheat, kamut, spelt, barley, quinoa, rice, millet, lentil, chick pea…) in a blender. 2. Turn the blender on high and watch the show. The grain will continue to ground finer and finer, and it will rise up the sides of the blender. You will know that is finished grinding when the flour stops falling into the center of the centrifuge. 3. Remove flour from blender and sift according to your preferences. I used a rather large-holed sieve because I like eating grainy bread, but I recognize not everyone shares my love of sand-textured baked goods. 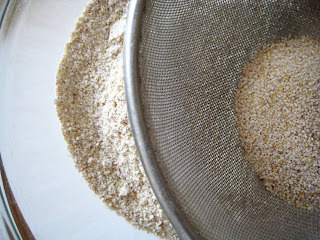 If you like a lighter flour, use a fine-mesh sieve. You can see the grit that comes out of the flour in the photograph. I actually saved these and sprinkled them on top of the bread I baked, but the birds love that stuff too, if you don’t. That’s it. I wish it were more complicated and impressive, but now you really have no excuses to keep buying dead, nutritionally void store-bought flour. Stayed tuned for the next post when I will walk you through baking a loaf of bread, step-by-step, made with flour that you milled all by yourself. Even your blender will be flabbergasted. Wow! I didn’t know you could mill rains at home with just a blender! I will definitely try it since grains milled at home are going to be so much more healthier! I realise this is a very old post but I just came across it searching for a bread recipe! I’ve been making my own buckwheat flour in my coffee grinder for a while now but didn’t know it could be done with other grains and beans! I tried with wheat once but the loaf I baked with it turned out miserable so I haven’t bothered with anything else since! I was just wondering if this will work with nuts as well? I’d like to make almond flour but I’m not sure if they’ll be too oily and go straight into a paste…? And now my question: Isn’t flour made from e.g. chickpeas going to still have toxins in them because they haven’t been soaked before grinding? Just found your site and very excited to try your recipes. Hi Sarah! I recently discovered your blog and I love it! Quick question- have you ever tried any of your own milled flours to make pasta? Do you have a recommendation for what I could try to mill for a pasta flour? Thanks! 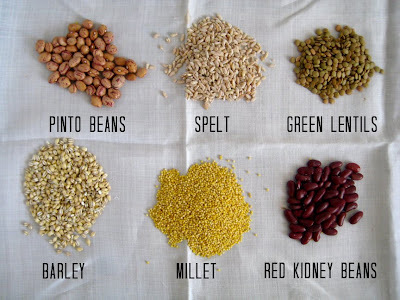 now because of the phytic acid and enzyme inhibitors that exist in grains and legumes, do you soak and dehydrate first? have you ever? what are your thoughts around that, especially with legumes? I have a Vitamix blender and it’s sold with an optional attachment for blending flours. Since the blender was expensive as it was, I didn’t pay even more for the attachment. I assumed that if there’s something different to buy to make flours that I couldn’t do it in the blender. Do you know what the flour milling attachment for blenders does differently? I loved this idea. I immediately set out and got wheat berries to make flour. I sifted it, but left it rather chunky for breads. I then sifted another batch several times for a fine flour. They both taste great, but it doesn’t act as normal flour. My bread is turning out short instead of rising beautifully as before and all of my other baked goods are coming out gummy and rubbery. These aren’t new recipes either. The only difference is the flour. As much as I hate to say it, I’m going to have to go back to store-bought flour or buy a $300 grain mill. If I lived in the prairies I’m sure I could find local mills and get it from there, but that’s not the case in the great lakes area. Keep the flour in the fridge for a month, or the freezer for longer. Hey Sarah! How long will the flour keep after grinding? Does it need to be refrigerated? Yes, make sure the grains are dry again before grinding them. Otherwise, they will clog up the blender and you will get a nasty paste that is impossible to work with! Hi Sarah, if you wash the grains do they need to dry before you mill them? Thanks for doing this blog, I’m excited to try the recipes! 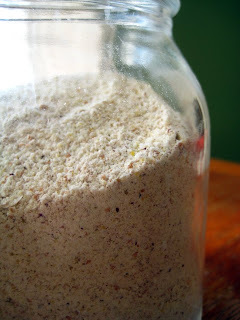 1 – I haven’t tried a food processor to make flour. I know that the blender works because of the gravity factor, but give it a shot! 2 – yes, I do wash the grains before grinding them, but it’s not totally necessary. And I haven’t noticed the quinoa flour has a bitter taste because I always use a mix with other flours. hey sarah! could i use a food processor instead of a blender to mill? it’s a rainy day in ohio so i am going to make your ezekiel bread 🙂 can’t wait!